" Philippine News Gives Timely Headlines "
"Diverse Local And Global Leads For Diverse People"
Philippine news can give coverage over Philippine radio, Philippine TV and even Filipino websites to match your simple-to-elegant news and information wants. It’s an aggregate result of development over time that has brought the Philippines to a position of having one of the best information and communications infrastructures in Asia. The internet has improved the country’s news gathering and distribution capability, so you will not miss keeping in touch with your home country through that medium. You can satisfy your digital compulsion in-country anytime. There are lots of websites bearing the term “Filipino News”. Some are threads of mainstream media URLs. All target the Filipino audience. Filipinos both here and abroad look for news about anything about the Philippines… those news are simply called Filipino news. Circa 2011, there are 387 national and local newspapers in the Philippines. Most of them have online versions of their news. There are several news firms in-country that attach the Filipino term “balita” (means news) either on their brand or corporate name. One is the Balita tabloid, a competitive subsidiary of the broadsheet newspaper Manila Bulletin. 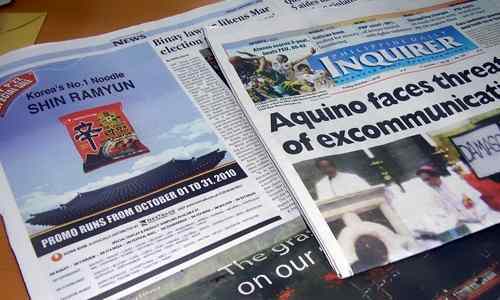 This broadsheet newspaper is popularly known as the Inquirer. It enjoys a daily circulation of 260,000 copies as of 2011. It was founded by Eugenia Apostol, Max Solivén and Betty Go-Belmonte on December 9, 1985. They claim…’We are the biggest’. 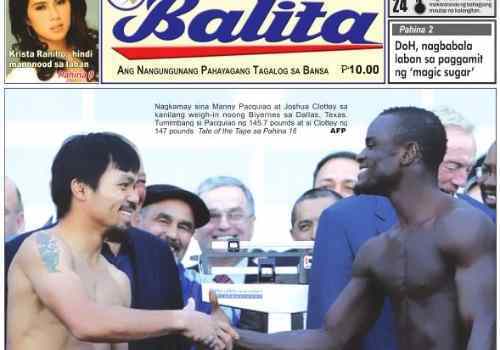 It is one of the Philippines' largest broadsheet newspapers by circulation. 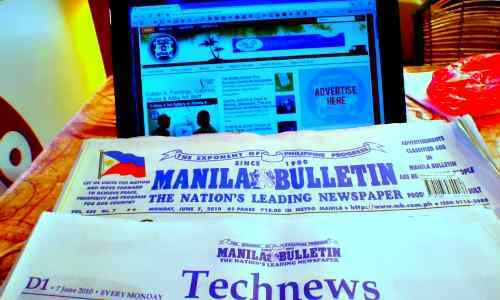 It was founded in 1900 as a shipping journal and is the second-oldest Philippine newspaper, second only to The Manila Times. It was originally owned by a Swiss expatriate named Hans Menzi… and now by Filipino-Chinese business mogul Emilio Yap. Television officially came to the Philippines with its first telecast in 1953. It was the dream of James Lindenberg, an American engineer… recognized as the Father of Philippine Television. There are 138 TV stations throughout the country. Radio broadcasting in the Philippines started in 1922 at Pasay City when a certain Mrs. Redgrave, an American, began test broadcasting from Nichols air field (now called Villamor airbase) with a five-watt transmitter. There are 540 radio stations country-wide. Today’s Philippine news can satisfy anyone’s information needs. That’s more than possible. The Philippines has one of the best information and communications infrastructures in Asia. And it is very well an internet-able country. These news offers timely, relevant local and global headlines to match your simple-to-elegant news and information wants. Want to know more about Philippines media?